BAHIA 46 Catamaran charter Greece Fountaine Pajot is offered for your sailing holidays and Greek Islands cruises with family children or friends offering specious accommodations for 8 guests in 4 double cabins (has another 2 cabins in the gangway) and 4 heads. Performance and elegance are the hallmarks of the stunning Bahia 46 - a masterpiece from the design offices of Joubert Nivelt and Olivier Flahault. 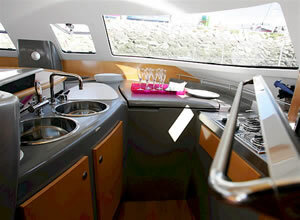 In keeping with Fountaine Pajot’s other sailing catamarans, the Bahia 46 has a convivial and spacious saloon that includes a superb bar that separates the galley. 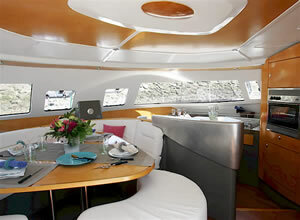 The Bahia 46 is available in two versions. Maestro: On the starboard side, the hull accommodates an exclusive private suite with a double cabin and semi-island bed, a separate bathroom and a splendid saloon equipped with storage space, divan and desk in the cabinetwork. 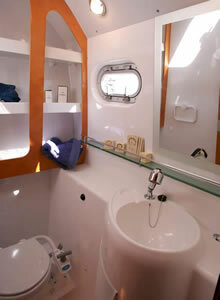 On the port side, the hull includes two double cabins, two bathrooms and a cabin in the gangway. 4 Double Cabins: With its four double cabins and four bathrooms, as well as two cabins in the gangway, this Bahia 46 version is available with the same superior quality fittings and finishes. 1. 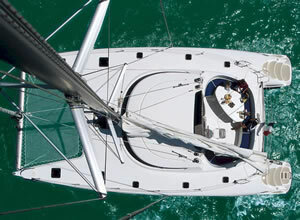 Superior balance under sail with an easy to handle Genoa. 2. A steering station unique in design and quality. 3. An expansive and well protected cockpit. 4. Beautifully styled and comfortable transom steps. 5. 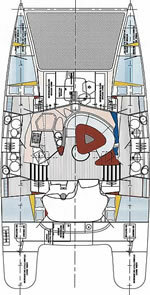 A spacious and clean deck layout that affords easy movement and carefree cruising. 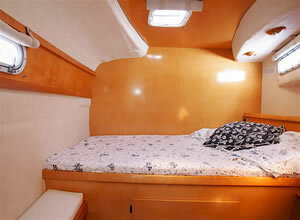 Ask us about booking Catamaran charter Greece the BAHIA 46.